I'm so excited to read these fantastic books by the end of December. 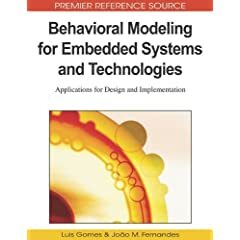 Today I came across this fantastic source on behavioural modelling of embedded systems. Although it's way pricey on a tight student budget, I believe the extensive definition of such complex topic is worth every penny. I got hold of it for a couple of hours only, but I'm still very much impressed by it. Also, I've been reading this book for a few weeks now. It is very exciting to see how human cognition works or in other words "philosophy of the mind" and it helps to utilize some of those concepts as abstracts into designing embedded systems. 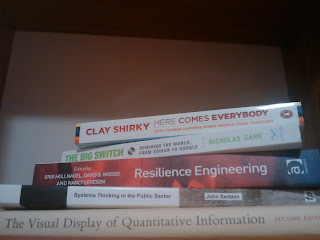 The first one is my favorite and is the most essential for those ambitious engineers who want to be project leaders and gain essential management skills. A comprehensive and practical guide to the development of "hardware aware" software which meets the demanding constraints of applications based on ARM architecture. A fairly good guide on how to modularize your Java program in a fast and effective way by breaking it down into smaller, cohesive and more digestible pieces. A few weeks ago I could manage to deliver a surprisingly good presentation at BT labs in Ipswitch. OGC's standards which I explained in one of my posts much earlier are actually quite good in order to provide a generic way of communication for sensors in general. But the primary issue is how to integrate those standards into resource-constraint sensors. Apart from the operating system that I personally think is meaningless when it comes to sensors, middlware has to be mainly in charge of all processing and activities within sensor platforms. Now, what makes it more challenging is the fact that OGC's standards and middleware have to be combined together, with all those limitations in mind, regardless of the hardware specifications. What I proposed was, instead of having all the standards together in one layer, they can be split into two categories. This in fact sounds quite awkward and not doable, but with a bit of brain storming you'll be convinced of its feasibility. There are seven types of encoding for the SWE standards. The upper three are the descriptive XML-based encoding that deal with sensors or transducers directly. Since these three don't take much processing, they can be done within the framework of my proposed middleware. The lower four are standard web services and they make it very inconvenient for the middleware to deal with these concurrently. Therefore the upper three are in one layer and the lower ones in another. The abstract design of my middleware looks like the above figure. I got a t-shirt from James Gosling during the t-shirt shooting contest, PLUS I won a JavaFx mobile phone which came as a surprise to everyone. This morning's general session was such an amazing kick-off for this year's JavaOne. Jonathan Schwartz the president of Sun Microsystems gave a remarkable speech on how Java began to conquer mobile world and became a must-have for every mobile user. It is interesting to know, apart from the vast invasion of Java virtual machine in every desktop, Java has significantly transformed itself into an essential part of every mobile device so that companies like Symbian, Microsoft and Palm desperately attempt to stay updated with the latest modifications in JME in order to well adapt and achieve the best performance. He then called James Gosling the founder of JAVA programming language and Scott McNealy the former president of Sun Microsystems up on stage. It was so fascinating to see these three geniuses together, who have undoubtedly changed the way the world evolves. Here is my extremely specialised schedule for 1-5 June. The fight is not over yet, let's hope the best for uefa champions league. سال نوی ایرانی را به تمام ایرانیان , فارسی زبانان و همه کسانی که نوروز را جشن می گیرند تبریک می گویم و امیدوارم سالی پر از موفقیت و سلامتی و سر بلندی رو داشته باشید. At first look, seems to be just an advert, but with a little bit of thinking, it has a lot to say. Not only political !!! Last week I attended a workshop organised by the Austrian research centres on behalf of the SANY consortium at the Austria's national weather service agency (ZAMG) in Vienna. OpenGIS® Standards and Specifications are technical documents that detail interfaces or encodings. Software developers use these documents to build support for the interfaces or encodings into their products and services. These specifications are the main "products" of the Open Geospatial Consortium and have been developed by the membership to address specific interoperability challenges. Ideally, when specifications are implemented by two different software engineers working independently, the resulting components plug and play, that is they work together without further debugging. In an Open Geospatial Consortium, Inc. (OGC) initiative called Sensor Web Enablement (SWE), members of the OGC are building a unique and revolutionary framework of open standards for exploiting Web-connected sensors and sensor systems of all types: flood gauges, air pollution monitors, stress gauges on bridges, mobile heart monitors, Webcams, satellite-borne earth imaging devices and countless other sensors and sensor systems. Subscription to and publishing of alerts to be issued by sensors or sensor services based upon certain criteria. Above is a very brief introduction to OGC and SWE derived from Opengeospatial website. SANY-IP has developed a Sensor Service Architecture (SensorSA) with OGC SWE services used within which allows building of complete Environmental Monitoring Networks (EMNs) from standard-compliant components. The intention of the workshop was to teach the participants which SensorSA-compliant software components are available, and how to configure and deploy them. This is part of the research in my PhD studies which will later be required for further implementation. During the workshop I met many scientists and researchers using OGC's SWE for different European projects with various applications aimed at monitoring water quality and level, Earthquake, Weather, fire and etc. The World is in !! DEPRESSION !! Gordon Brown described the world financial crisis as 'depression' at prime minister's questions yesterday . It wasn't picked up by the Tory at the time, however Downing street announced that what he had meant was 'recession' and not 'depression' but had slipped up. It caused huge concerns amongst the MPs on both sides that he might know something that the others don't. It could have been a typical gaff for someone like George Bush, but Gordon Brown, hmm, I don't think so. He's been always not only quite careful about his words but also refusing to acknowledge the full depth of economic crisis, that's why it turned into such a big deal. Was it deliberate or just a slip of the tongue? Well, If I was in his position I would have said what I meant was 'DEEP RECESSION'. It makes even more sense. But this last one aside, I personally think he wished he would have never said that famous slogan of his: "British Jobs for British Workers", since David Cameron gave him a hard time on this.